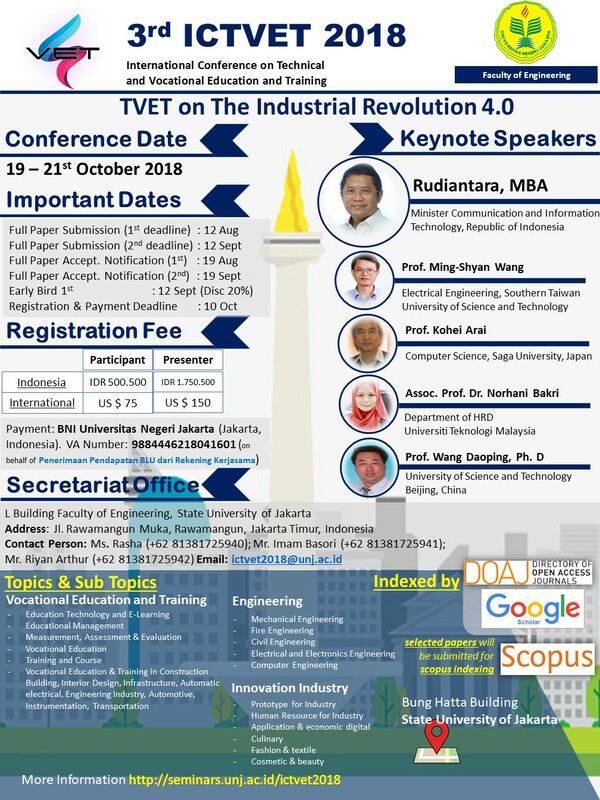 THE 3rd INTERNATIONAL CONFERENCE ON TECHNICAL AND VOCATIONAL EDUCATION AND TRAINING (3rd ICTVET) 2018 will be held with theme “Technical & Vocational Education Training on The Industrial Revolution 4.0”. Innovation in education, industry, vocational education, and its various supporting elements are expected to provide answers to the challenges of the Industrial Revolution 4.0. The Industrial Revolution 4.0 makes information technology as the backbone of communication, distribution channels, and competitive weapon in global community. Indonesia, with big potential of human resources, natural resources and strategic geographical position, must encourages innovations to confront the Industrial Revolution 4.0 in the Asia Pacific region. This conference specializes in topics related to Vocational Education and Training, Engineering, and Innovation Industry.